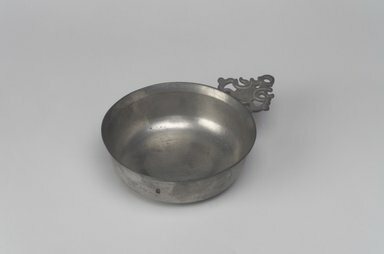 Round pewter porringer with flaring sides and bent rim. Attached handle (soldered) of general triangle shape with fancy openwork. CONDITION: Fair; allover light scratches and spots of discoloration; deep pit marks in center; and worn and becoming detached; spot of adhesive residue on outer side of bowl; top edge bent.